OMID’s ultimate goal is to train its graduates so that our center in Iran is eventually run by OMID graduates. We believe that no one understands the problems that a victim of abuse and neglect has to deal with better than those who have experienced them. With this in mind, we have developed the Leadership and Peer Education Project (LPEP) dedicated to doing just this. Youth leadership programs are of key importance to the next generation in order to become successful adults because such programs provide young people with life changing experiences and a safe place to form positive relationships with adults and peers. 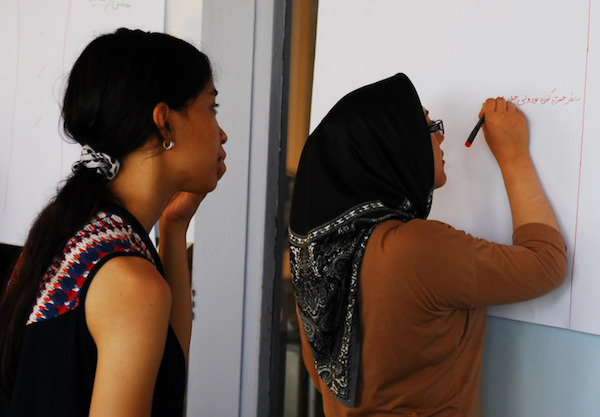 The OMID Leadership program (called Simorgh) started in April 2017 as a second phase of our Peer Education program, it’s purpose to not only train and prepare the young women in this program to be facilitators in educational and developmental classes, but also to provide different work experiences within OMID, such as being a part of our outreach program or running OMID’s internal newspaper, Mehrdohkt. The skills needed to take responsibility for personal action and to work with other people in achieving goals are embodied in what we call leadership skills. Simorgh started its mission based on working on the young women’s strengths as well as identifying potential leaders among our young women and then providing them with the right platform to achieve their highest potential. The six-month training program included participating in eight hours of classes weekly, which were defined by three phases. The first phase focused on various leadership skills such as me and my assets, values, zones of regulation, goal setting, time management and problem solving, which manly tried to provide the participant with the right skills to be the future leaders. Second part of the program was dedicated to teach the young women how to define a project and manage it, in this phase they learned vital skills to start and run a project on their own. The third phase of the leadership program worked on giving the adequate knowledge to these young women to train them to become facilitators inside OMID. By the end of this six month period, eight of the participants are going to be selected, based on their performance through the program, for allocated jobs. These successfully selected young women will then continue their training under our mentorship program, where each one of them will have a mentor to help them to succeed in their positions. We will be updating you on further developments about this program over the coming months also.